Have you ever wondered what it is like to beaver away for several decades in search of something that you and a small like minded band of people think is important, but that is regarded by most at best as a backwater, and at worst as an irrelevance? Have you wondered what would happen if eventually you discovered what you were looking for, just as the time was ripe for it to emerge from obscurity to become one of the most important new and trendy areas of research around, that all of a sudden everyone wanted a piece of? This is just what happened to the small band of dedicated KBO (Kuiper Belt Object) hunters after the discovery in 1992 of the first object whose orbit was significantly outside those of the major planets. Suddenly the search for further such objects became a noble quest to locate the pristine matter from which our solar system was created. So this book is about the intrepid and dedicated pioneers who begged and borrowed time on some of the world's largest aperture telescopes, who (before the advent of advanced software capable of combining several deep exposures of the same area of sky in different moving frames of reference) had to regularly check plates containing thousands of stars using a blink comparator to spot anything faint that was moving. So, this book is an adventure story of the “dedicated scientists succeed, despite suffering lack of funding and the general apathy of their peers” genre. It succeeds admirably in portraying the difficulty involved in trying to detect objects that are probably as dark as coal, a few hundred miles across, and at a distance of 50AU or so from the sun. It explains the technical developments in both hardware and software that made their detection possible, and it does capture what might be termed the “human” side of the drama. However as a book it has much, much more than this to offer. Alongside the human story is the science. Davies presents us with the model of how our solar system is presently understood to have been created, and why KBOs may represent the most pristine remnants from that event. What the KBOs are made of is thus central to their scientific importance. However if simply detecting them is difficult, finding out what they are made of, for example by examining their surface spectra, is even more of a challenge, and one that at the time of writing this book (2000) stretched technology to and perhaps beyond the limit. What seems clear is that some of the 100 or so KBOs known at the time of writing have a reddish tinge, and it has been speculated that they may be coated in so-called “tholins” (polymeric gunge to you and me!). Others appear more bluish in colour, and it has been suggested more recently resurfaced. However passions run high when hard data has to be replaced by assumptions. The other property critical in helping our understanding of the formation of solar systems is their mass distribution. However this too is fraught with assumptions and likely to be significantly upgraded as more and fainter KBOs are discovered. The other theme of the science is the growing understanding of a connection between asteroids, comets and KBOs. Once upon a time a comet was just a comet and an asteroid was clearly, well an asteroid. However the entry of KBOs into the picture in some numbers plus the discovery of a strange class of Centaur asteroids has destroyed old certainties. The book goes into a great deal of fascinating detail about the orbital dynamics of KBOs, how orbital resonances, especially with Uranus and Neptune, can propel these objects further into the solar system, perhaps for them to become Centaurs for a while in semi-stable (though eccentric) orbits, or perhaps to be catapulted to our notice as a short period comet. There is also an exploration of the link between the Kuiper Belt and the Oort cloud. Does the former feed the latter? This is particularly relevant, given the thrall that comets have held us in (and indeed still do), and the popular interest in the possible mass extinctions caused by comets and/or asteroids. Of all the controversies and arguments raised in the book, it is interesting that the most passion and vitriol surrounds the thorny issue of naming. In this review I have referred to the small astronomical objects found orbiting in the vicinity and well beyond Neptune as KBO's. However it is pointed out quite rightly by John Davies that it was not Kuiper, but an Irish astronomer Edgeworth, who first speculated that there may be a considerable collection of icy bodies beyond Neptune. There is a campaign therefore to refer to them as EKOs (Edgeworth-Kuiper Objects) rather than KBOs. Of course the diplomats of science have suggested that we offend neither camp, referring to them blandly as TNOs, Trans Neptunian Objects. (If that wasn't enough the pulse is raised even more by the discussion of whether or not Pluto should be reclassified as a KBO/EKO! This book is well written and easy to follow and will appeal both for the human story, and for the science generated by the birth of this new area of study. However it was written during 2000, and inevitably the pace of change is extremely rapid in this area, so for more up to date information, such as the discovery that some KBOs are double, and more up to date spectral work, you would need to consult the scientific literature. This isn't a serious defect though. 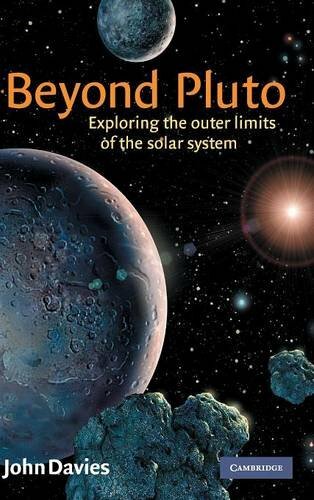 I was thoroughly gripped by the book, and like me, you will probably be left wondering why on earth NASA worked so hard a couple of years ago to kill the Pluto-Kuiper Express mission!